Today's lovely giveaway is from Talk About Sweet. 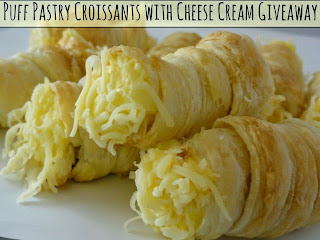 One lucky winner will receive 12 Traditional Puff Pastry Croissants with Cheese Cream. Each delectable pastry is handmade and filled with REAL cheese, milk, flour and egg yolk cooked cream. To finish off this special treat both sides are dipped in grated cheese. These delightful pastries are made with a secret family recipe! Who wants to try one or two or maybe three? Make sure to check out the other goodies from Talk About Sweet! I think the 12 piece macaroons look absolutely divine. Best wishes to all who enter this fun giveaway! Make sure to enter this All Things Pink Giveaway! Aside from the Puff Pastry Croissants with Cheese Cream, I would also love to try the mini coconut ball cakes. They look and sound absolutely fantastic. I would love to try some macarons! I would love to try out the 1 lb fudge,walnut chocolate and the buttercream cookies, chocolate cream. The chocolate swirl twisted bread looks YUMMY! I would like to try chocolate croissant. The thanksgiving butter cookies look fabulous. I would definitely love to try the mint chocolate fudge. CONNIE SOWARDS commenting: I'd like to try the Pumpkin cake pops! Thanks so much for linking! Come back again Monday. I'd like the chocolate dipped orange marshmallow! I would love the 12 piece macaroons! The Linzer cookies look amazing!